Today, RFcnn.com, a famous RF connector manufacturer, has launched an SMA RF connector promotion. All of the newly released items are provided at very low prices. Today, RFcnn.com, a famous RF connector manufacturer, has launched an SMA RF connector promotion. All of the newly released items are provided at very low prices. According to the CEO of the company, the first 20 buyers will receive extra discounts before Oct. 24, 2013. As a senior engineer of the company states, an SMA (SubMiniature version A) connector is a semi-precision coaxial RF connector developed as a minimal connector interface for coaxial cable with a screw type coupling mechanism. It is made for use from DC to 18 GHz. The CEO of RFcnn.com says, “We offer a wide range of RF connectors for customers worldwide. We are now one of the most popular RF connector wholesalers, and this is supported with lots of facts and figures. Please note that the promotion is valid until Oct. 24, 2013,” says the CEO of the company. In addition, the innovation-based company provides excellent pre-sale service and after-sale service. Its quality checks and standards are quite strict, meeting the highest global quality standards. It ensures that each product delivered is of top quality. RFcnn.com is an online outlet of Zhenjiang Fourstar Electronics Co. LTD, which is a China-based company that aims to provide customers high quality products at the lowest possible prices. Customers can try the company’s products through sample orders with a long-term contract. Most of the customers come back soon after their first deals. 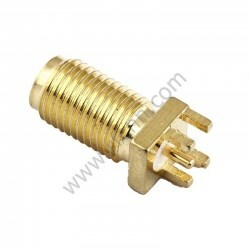 More details about the company’s top quality SMA RF connectors can be found at: http://www.rfcnn.com/SMA-Female-For-PCB-Board-Edge-Soldering-RF-Connector-97.html.